You end up with Raks Geek: Geek+Bellydance+Fire, Chicago’s one and only geek-themed bellydance and fire performance showcase. On Friday, August 16 and Saturday, August 17, Raks Geek invades the Prop Theater, 3502-4 N. Elston Street, Chicago, IL 60618. Tickets are available via Brown Paper Tickets at both general admission and VIP admission tiers. So what is Raks Geek and why does the show exist? [A] lot of tribal dancers are self-confessed nerds… So what if we took professional bellydancers, put them together with trained fire spinners, and allowed them to do justice to their favorite geek subjects? That’s what Raks Geek is all about. Our first incarnation of the show featured a bellydancing Wookie backed by a Klingon Band, an epic Assassin’s Creed duet, fire spinning to Tron: Legacy and Mission: Impossible, and so much more. The Wookie bellydance video went viral and got us noticed even by international press, like the UK’s The Daily Mail. It really is a brain-endingly awesome mash-up of fandoms and performance art. This latest version of the show promises to be just as epic. Raks Geek again features the talents of bellydance troupe members from Chicago-based Read My Hips: Dawn Xiana Moon (who is the show director/producer), Lee Na-Moo, Cecelia Zheng, Kamrah and Dimitra Louloudaki, with Night Magic Designs members Shannara Bathory and Lisa Wiedemann, who will join me in setting the show on fire. This is one stellar line up of nerdtastic talent and a spectacular example of the unexpected but worthwhile artistic partnerships that occur in Chicago. 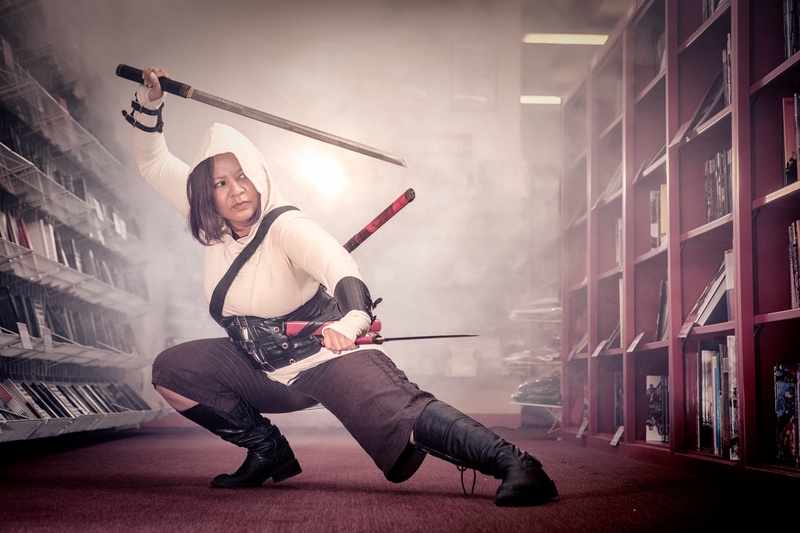 Because why wouldn’t you do Assassin’s Creed cosplay in a comic store with a smoke machine? Full Disclosure: I will be performing on Friday, August 16 ONLY, but this is one of the most unique and awesomely geeky productions I’ve ever had the good fortune to be a part of. You’re going to have a fantastic time at the show either way. But if you’d like to see the 3-person piece Bathory, Weidemann and I are putting together, be sure to come on Friday! The Prop Theater is a limited capacity-seating venue, so get your tickets now! This entry was posted in Event, Fire/Flow, Performance and tagged awesome, bellydancing, fire dancing, fire spinning, geek, nerd, Night Magic Designs, performance, Prop Theater, Raks Geek, Read My Hips by Michi Trota. Bookmark the permalink.